Brian Smith started cooking as a young child in the kitchen with his mother and grandmother, where he began mastering skills like creating crème brulee. By the age of sixteen, Chef Brian had already gained experience working in several local kitchens. After completing culinary school his career boomed with a position in the kitchen of Acacia next to culinary master Chef Albert Hall. 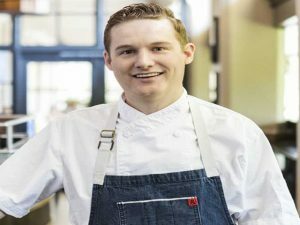 Brian expanded his culinary vision by taking his career on the road. Traveling to the Bay Area, Brian added a huge notch on his belt working in the two Michelin Star restaurant, Coi. Coming back to Tucson, Brian had a deeper connection to high-end cuisine and how to allow seasonal ingredients to shine on a plate. Taking on the role of Executive Chef at Maynards Kitchen, Brian has been Instrumental in creating a fresh approach to the menu and vibe of this award-winning downtown restaurant. Brian has been an ambassador for Tucson as a city of gastronomy on the international stage – with trips to Parma Italy for the annual Gola Gola Festival and to Belum Brazil for a UNESCO culinary event featuring chefs from the many World Cities of Gastronomy.